by alex Happy Canada Day all! Of course Canada has been a blessing for many Filipinos (the 4th largest visible minority in the country). It has provided us with opportunities that we would be hard pressed to find in the Philippines. I remember my first visit back home in 2001 when I saw how my relatives lived and I often still think about what would have become of me and my family had we stayed. Of course all of our experiences are unique and with a community as large as ours the stories of migration vary widely, but when you look at the big picture a heart wrenching reality emerges. I remember believing for the longest time that our community was doing just as well as other Asian communities. I mean, aren't Asians (and thus by default us) studious, well educated, hard working, and thus able to get good jobs? I remember being very young and living in an apartment [seen in the background of the photo above] near Vic Park TTC station with all my relatives (my uncle, two aunts, parents, and both sets of grandparents). Weren't we able to succeed? It took me some time to realise how lucky my family had been. On arrival, Filipino immigrants tend to have high levels of education as well as less tangible forms of cultural preparedness, such as high levels of English language competency. Overall, these assets have resulted in a relatively successful integration, both into the social fabric of Canadian cities and into formal employment. Filipinos have very high levels of participation in the labour force, low levels of unemployment and welfare claims, and a low incidence of self-employment. My family was one of the lucky ones. They were lucky to arrive in Canada at a time when the doors were still fairly open and they weren't tied to a particular kind of employment. If we, a 'regular' Filipino family (as in not from the Manila upper class), were to come now things would be much different. My mother would probably have to come in as a live-in caregiver, or my father as a factory or food service worker. I think about that and I shudder. My thoughts of what my life would be like if we had stayed in the Phils are replaced by the much scarier thought of how my life would have been with the years of family separation, and uncertainty of immigration. Take what's happening to Juana Tejada as an example, she's jumped through the hoops that Canada put in front of her for her landed immigrant status, but since she has been discovered to have developed terminal cancer (while working in Canada), this country now considers her an economic burden and plans to deport her. So many caregivers are leaving their families back home in the care of their spouses so that they can care for foreign children (among other jobs)--just for the chance to become Canadian citizens. They accept the hardship, the stress, and yes, often the abuse, just for that chance. As you can probably guess, this leads to countless problems from marital and abandonment issues, to even more serious issues like abuse. These are the happy patriotic thoughts passing through my head this Canada Day. While on one hand I am very grateful for what this country has been able to do for my family, on the other hand I am saddened by the fact that this is not the same happy experience for all. 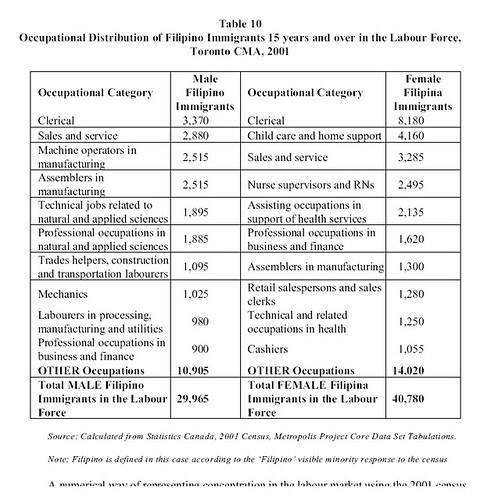 While there are well-known barriers based on credential recognition in certain licensed professions, there are also more subtle barriers to advancement based on the ways in which Filipino identity gets socially constructed in workplaces and labour markets. Ultimately, then, an understanding of the Filipino experience in Canada must come to terms with the construction of difference in Canadian society – through processes of racialization, discrimination, and stereotyping of Filipino-ness. above: Willie Reodica, father of Jeffrey, a teen shot and killed by plain clothes police officers.